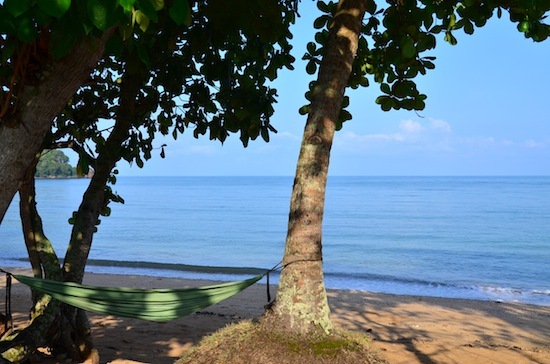 Ko Libong’s original resort is still one of the most relaxing places to stay on any of the Trang islands. 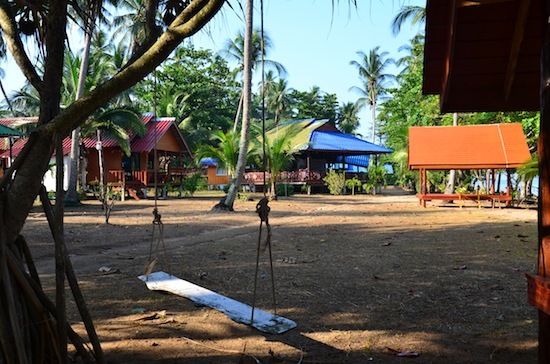 If you can look past the unoriginal name, Libong Beach Resort provides comfort, consistency and value for everyone from budget backpackers to large families. The only requirement for staying here is a respect for the peace and quiet. A casual swing for an hour or three? Overlooking the golden sand of Lang Khao beach on the west coast, the resort fits seamlessly into Ko Libong’s unassuming personality. A lawn adorned with coconut trees gives way to the beach, where swings, loungers and hammocks are set under broad umbrella trees. Buildings are fairly far spread out over the property, allowing for plenty of breathing room. 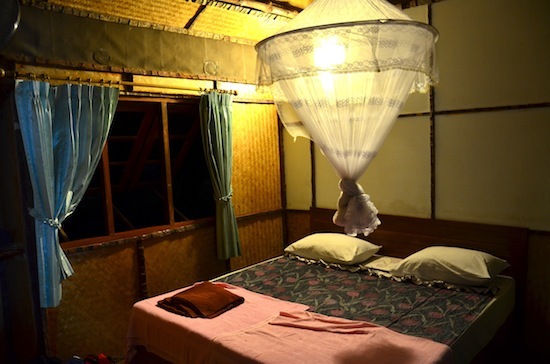 Wood-and-bamboo stilted cabins enjoy direct sea views and are ideal for couples. After the ambient lights that dot the grounds are shut off, it’s as though you can see all the way across the Milky Way from your balcony. With small waves lapping ashore and rattan leaves rustling in the breeze, we slept better here than we had in ages. Now that’s what a bungalow should be. Spacious interiors are rustic but clean and comfy, with high ceilings, firm beds with light blankets raised off hardwood floors, large mosquito nets, wall-mounted fans (or air-con), soft lighting and a few tables. Heavy wood-and-glass doors open onto large porches with wood furniture, and three windows along the back walls allow for the breeze to blow through. Partially open-air bathrooms are huge, hot-water showers situated in a separate space partitioned by dolphin shower curtains. 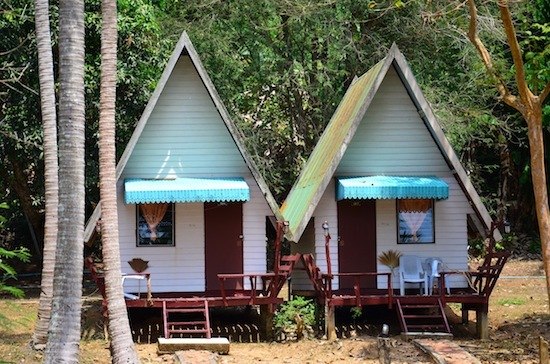 At the foot of a forested hill behind the beachfront cabins are a string of tall and thin A-frame bungalows with white siding and smaller porches. These were already closed for the season when we last passed through, but we were told that they’re simpler and come with fans, mosquito nets, private bathrooms and one window. While small, we reckon they’ll do the trick for budget tavellers in high season. The resort also offers several large family bungalows set up in pairs on the other side of the restaurant. These are also simple and often show more wear-and-tear, with less-romantic bathrooms than the double bungalows. The spacious wood numbers come with three single beds, wide glass doors, private porches and air-con or fan. Again, these represent solid value for what you get. While the rooms are what we look for in an affordable beach resort, it’s the staff, facilities and activity options that push the resort from “good” to “terrific.” The family owners have been welcoming travellers for over 20 years. They really care about their guests, maintaining a laid-back atmosphere while also keeping a careful eye on the details. Staff members nearly always flash a smile when walking past. WiFi is available, but this is an ideal place for a break from technology. The large open-sided restaurant serves notably good Thai food to go with direct sea views from your table, making up for fairly high prices with large portions. When the restaurants at the other nearby resorts were closed or barely open in late March, Libong Beach Resort offered their full menu, including fresh coffee, great smoothies and seafood barbecue after dark. Before a meal, you might pop over to the beachfront pavilion for a Thai massage. The resort has its own longtail boat that’s used for group day trips in high season to Ko Muk’s Emerald Cave and snorkelling around Ko Kradan and Ko Ngai. Staff also arrange extended camping trips to Ko Rok. Closer to home, they offer trips to spot Libong’s endangered dugongs. Motorbikes, bicycles and kayaks are also available. Libong Beach Resort is open year round and has long been the most consistent resort on the island. Expect to pay around 300 baht below the high season rates listed here if arriving in the shoulder months of November, March and April, and 300 baht more at the peak time around the Christmas/New Year holidays. Where are you planning on heading to after Ko Libong? Here are some spots commonly visited from here, or click here to see a full destination list for Thailand.